Likud MK demands Foreign Affairs and Defense Committee convene urgent meeting on Iranian threat, after the country's ballistic missile test. 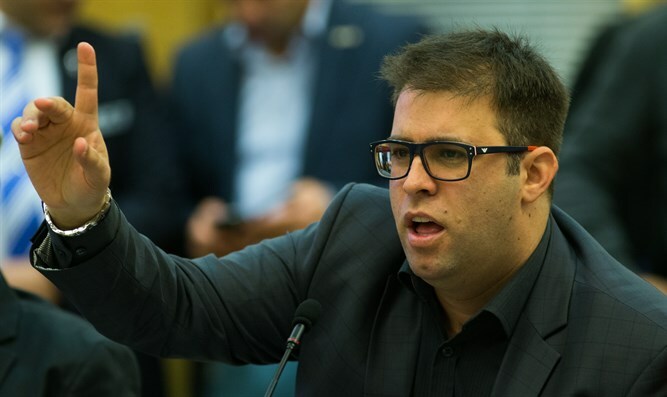 MK Oren Hazan (Likud), a member of the Foreign Affairs and Defense Committee, has demanded that the chairman of the committee convene an urgent discussion on the Iranian threat. "The world’s silence vis-a-vis the Iranians is reminiscent of the world’s silence in the face of North Korea's nuclear bullying, which led to a situation in which they now have nuclear weapons that they can use at any moment - and I do not rule out that this will happen soon. “As far as Israel is concerned, the launching of the missile by the Iranians after President Trump's clear words points a finger at the president of the United States, the free world, and especially Israel, and serves as a clear warning that the Iranian hourglass is running out,” Hazan said. "We, as a country with a small territory, do not have the ability to absorb an atomic bomb and continue to exist. It is an existential and tangible danger to the Jewish people no less than the Holocaust. The only difference between World War II and today is that, now, we have the ability to prevent it. “Therefore, it is Israel's duty to inform the entire world, and the Iranians in particular, that a state that calls for the destruction of the State of Israel and is acting accordingly will be answered accordingly. It must be clearly stated that any offensive Iranian action against Israel will be met with the destruction of Tehran, and that is what must be done. " MK Hazan also stated, "As a member of the Foreign Affairs and Defense Committee, I believe that the policy of ambiguity that exists today harms the security of the State of Israel and could lead to its destruction. We do not have the luxury that others have to take a hit first and only then to act. 'One who rises to kill you - kill him first,’" Hazan said, citing a Talmudic phrase.